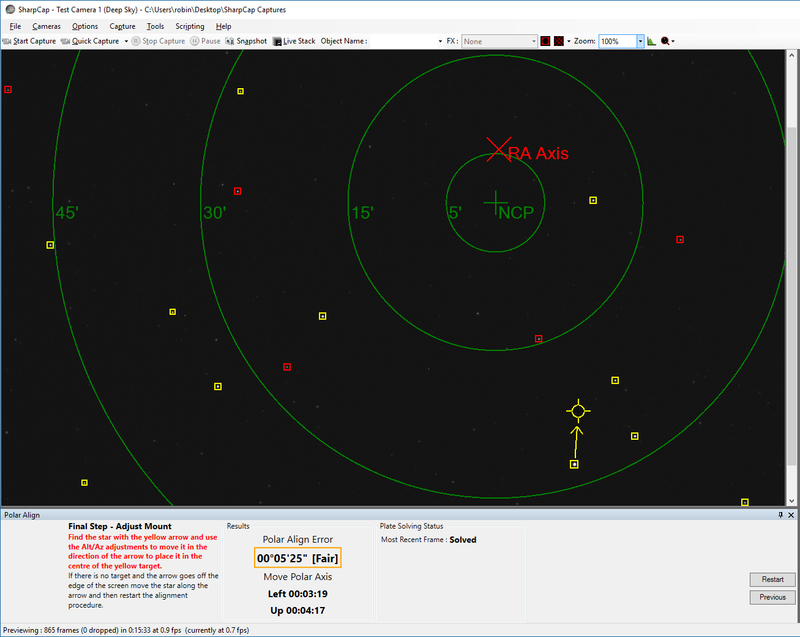 Polar Alignment – SharpCap – Lunar, Planetary, Solar and Deep Sky Imaging. EAA and Live Stacking. The idea was inspired by the PhotoPolarAlign application created by Themos Tsikas. Themos has been kind enough to help with testing and suggestions during the development of the polar alignment feature in SharpCap. Polar Alignment is a SharpCap Pro feature. You can test your polar alignment accuracy without a SharpCap Pro license to learn how the feature works, but you will need to buy a SharpCap Pro license to use the polar alignment adjustment stage that guides you in to correct alignment. SharpCap Pro enables you to use Polar Alignment and many other advanced features in SharpCap for just £10/year. 1. The exact area of sky represented in each image – this process is called Plate Solving. SharpCap has a built in plate solving algorithm that doesn’t need an internet connection or any other program or database to be installed. SharpCap’s plate solving only works within 5 degrees of the pole though (N or S). 2. The center of rotation about which the stars seem to rotate when going from the first to the second image. Since SharpCap has worked out exactly what RA&Dec the telescope was pointing at in each image, it knows where in the image (or perhaps how far off the image) the celestial pole is. It also knows the point about which the stars seem to rotate – that’s where your RA axis is currently pointing. If those two points are the same then your polar alignment is perfect. If they are not the same, all you need to do is adjust the Altitude and Azimuth adjusters of your mount until they are the same point and you have completed your polar alignment. SharpCap will guide you through this process with on-screen instructions, including a live update of how far you still need to move the mount in each direction to get perfect alignment. You can start the polar alignment procedure from the ‘Tools’ menu. If you want SharpCap to correct for atmospheric refraction then you need to configure that in the SharpCap settings before using polar alignment. Correction for atmospheric refraction requires SharpCap to know your position (lat/long). You can either enter this location manually or allow SharpCap to retrieve it from an ASCOM mount or estimate it using an internet based Geolocation service. Your location does not need to be highly accurate – an accuracy of within 1 degree in longitude and latitude will be fine. SharpCap only corrects for the average refraction caused by varying latitude – this increases from about 0.5 minutes of arc at 60N/S to 2 minutes of arc at 25 N/S. There is no need to account for the change in refraction due to temperature for polar alignment – at 50N the refraction only varies by 0.1 minutes of arc between -15C and +25C. When refraction correction is enabled you will see two crosses drawn for the North (or South) celestial pole – a darker one for its refracted position and a ligher one for the true position. The amount of correction being applied is also shown in the first step panel details. 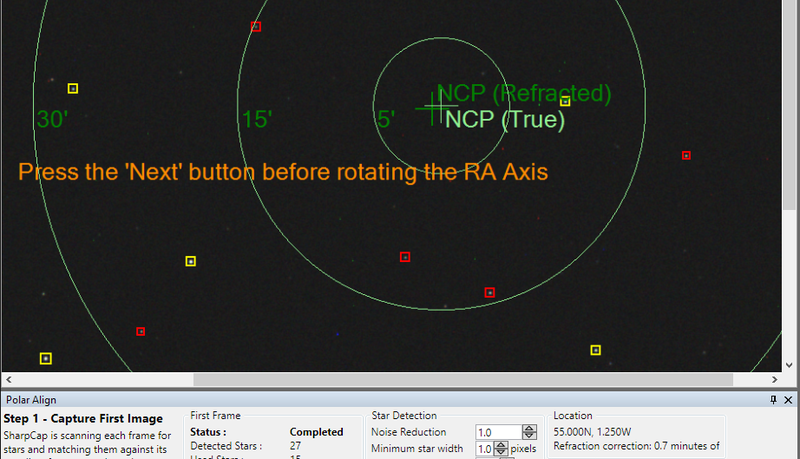 The stars SharpCap is using to perform the plate solving are highlighted in yellow, other stars are highlighted in red. The North (or South) celestial pole is shown and circles of different radii are shown around it. Note that the pole may be out of view – don’t worry if it is, carry on to the next stage. If the plate solving fails then there are three possible causes – not enough stars detected, too far from pole, field of view too large or too small. The last two require you to make physical changes to the setup, but the first might be fixable by adjusting the star detection parameters at the bottom of the screen or by adjusting the exposure or gain of the camera you are using. If the stars are too faint, try turning up the exposure, gain or digital gain. If hot pixels or noise are being picked up as stars, try turning up the noise reduction control. Once you have the first frame solved, press the ‘NEXT’ button to move to the next stage. After pressing ‘NEXT’, rotate the RA axis through about 90 degrees. You can do this either by unlocking the RA clutch or by using the mount’s GOTO system if it has one. SharpCap will continue attempting to plate solve each frame – once it manages to solve a frame that has rotated far enough it will offer the option to move on to the adjustment phase – looking a bit like this. 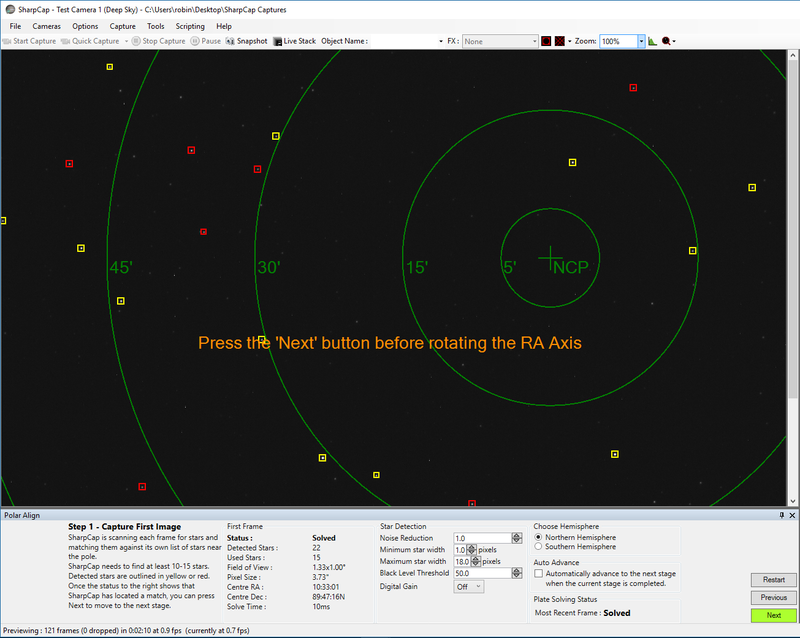 At this point, SharpCap has calculated the position in the image that the RA axis is pointing at – this is the point around which the image appeared to rotate. The RA axis point might be out of view, so don’t worry if it doesn’t show up, as long as the ‘NEXT’ button becomes enabled. If you can’t get the ‘NEXT’ button to enable then try different amounts of rotation (or rotating in the opposite direction). If that still fails then it’s likely that you aren’t picking up enough stars in the rotated position – the best way to fix this is to leave the mount in the rotated position and press the ‘Restart’ button to go back to the start of the alignment process. This leaves you looking at the rotated position with the star detection controls available to play with until you can get a plate solve in that orientation. DO NOT ADJUST THE ALTITUDE OR AZIMUTH UNTIL YOU HAVE PRESSED NEXT TO MOVE TO THE FINAL STAGE! 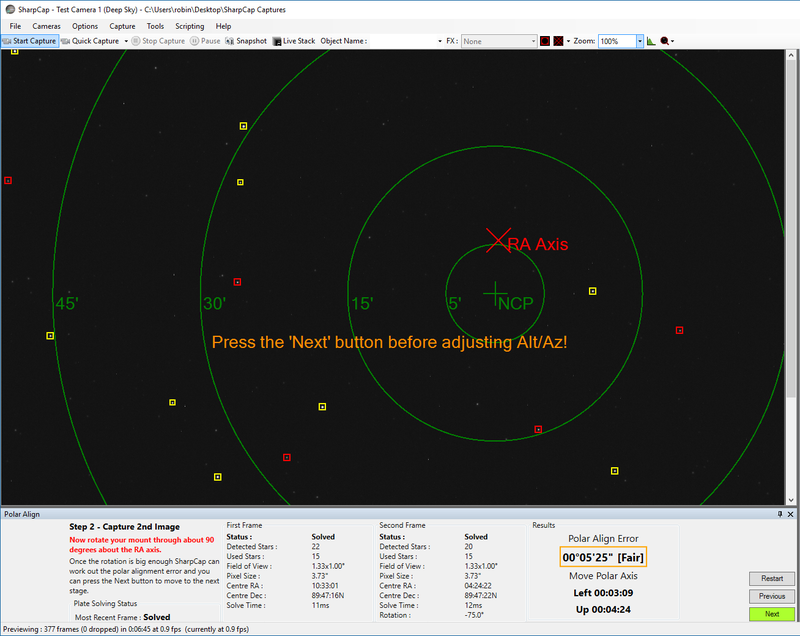 Once you’ve pressed the button to move to the adjustment stage, one of the brighter stars on screen will be highlighted with an arrow pointing to a target, like this. 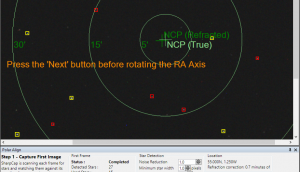 All you need to do to get good polar alignment is to move the indicated star into the target – if you do this you will also have lined up the NCP with the RA axis and you’ll be done. At the bottom of the screen, below the Polar Align Error figure are some guidelines indicating which direction you need to move your mount. These are calculated based on your position (latitude and longitude). If you haven’t set your position in the Polar Alignment settings page then your position is estimated based on your time zone and chosen hemisphere – in this case the directions may not be exact. During the adjustment phase the highlighted star might switch to a different one if the selected star is lost or moves out of view – no need to worry, just keep adjusting. As you get closer the arrow and target changes to a pair of parallel lines that need to be brought together to finalise the alignment process. If you find that the length of the arrow isn’t updating, or is only updating now and then, it’s likely that the plate solving isn’t working for every frame – you can either ignore the problem and just get the star into the target or alternatively you can try further tweaks to the gain or exposure to get the star detection and plate solving working more reliably. Try using a guiding camera (ZWO120MC, QHY5LII, Altair GPCAM, etc) with a ~200mm focal length finder-guider – this will give the correct field of view. Read the on-screen instructions – they will walk you through the procedure! Select a high gain and an exposure of 4-8s – this should let SharpCap see enough stars. If your mount is on a pier, the pier mounting plate bolts can often give finer adjustment than the mounts own alt/az adjusters. You don’t need to worry if your scope or finder is aligned with the mount correctly – misalignment won’t affect the result. SharpCap needs to know your approximate longitude to work out which direction (up/down/left/right) you need to move the mount. If your time zone is set incorrectly, you may get the wrong directions suggested. See this page for help troubleshooting problems with Polar Alignment.